While the market driven by short-term sentiment influenced by uncertainty regarding the future of the interest rate environment in the US, declining oil prices and the trade war with China, many smart money investors kept their optimism regarding the current bull run in the fourth quarter, while still hedging many of their long positions. However, as we know, big investors usually buy stocks with strong fundamentals, which is why we believe we can profit from imitating them. In this article, we are going to take a look at the smart money sentiment surrounding General Motors Company (NYSE:GM). Is General Motors Company (NYSE:GM) the right pick for your portfolio? Prominent investors are becoming less confident. The number of bullish hedge fund bets were trimmed by 1 in recent months. Our calculations also showed that GM isn’t among the 30 most popular stocks among hedge funds. If you’d ask most investors, hedge funds are viewed as worthless, outdated financial tools of years past. While there are over 8000 funds with their doors open today, We hone in on the crème de la crème of this group, about 750 funds. These investment experts orchestrate the majority of all hedge funds’ total asset base, and by following their inimitable equity investments, Insider Monkey has unearthed various investment strategies that have historically outperformed the S&P 500 index. Insider Monkey’s flagship hedge fund strategy beat the S&P 500 index by nearly 5 percentage points annually since its inception in May 2014 through early November 2018. We were able to generate large returns even by identifying short candidates. Our portfolio of short stocks lost 27.5% since February 2017 (through March 12th) even though the market was up nearly 25% during the same period. We just shared a list of 6 short targets in our latest quarterly update and they are already down an average of 6% in less than a month. We’re going to check out the key hedge fund action surrounding General Motors Company (NYSE:GM). How have hedgies been trading General Motors Company (NYSE:GM)? Heading into the first quarter of 2019, a total of 60 of the hedge funds tracked by Insider Monkey were long this stock, a change of -2% from the second quarter of 2018. 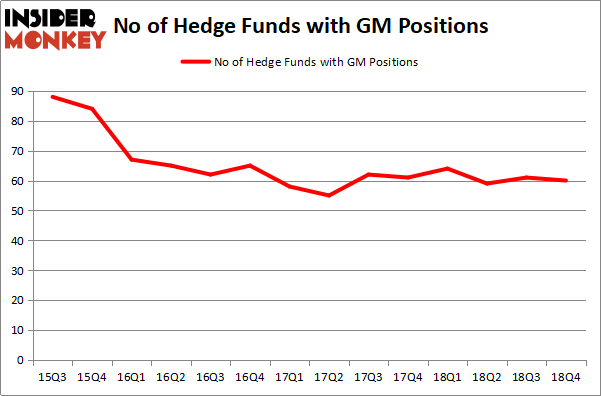 On the other hand, there were a total of 64 hedge funds with a bullish position in GM a year ago. With the smart money’s positions undergoing their usual ebb and flow, there exists a few key hedge fund managers who were boosting their holdings considerably (or already accumulated large positions). The largest stake in General Motors Company (NYSE:GM) was held by Berkshire Hathaway, which reported holding $2417.4 million worth of stock at the end of September. It was followed by Eagle Capital Management with a $687 million position. Other investors bullish on the company included Greenhaven Associates, Greenlight Capital, and Citadel Investment Group. Since General Motors Company (NYSE:GM) has witnessed declining sentiment from the aggregate hedge fund industry, it’s easy to see that there exists a select few funds who were dropping their positions entirely last quarter. It’s worth mentioning that Tom Wagner and Ara Cohen’s Knighthead Capital sold off the biggest position of the 700 funds watched by Insider Monkey, totaling about $23.6 million in call options, and Steve Cohen’s Point72 Asset Management was right behind this move, as the fund dumped about $20.2 million worth. These bearish behaviors are interesting, as total hedge fund interest dropped by 1 funds last quarter. Let’s now take a look at hedge fund activity in other stocks similar to General Motors Company (NYSE:GM). These stocks are The Estee Lauder Companies Inc (NYSE:EL), America Movil SAB de CV (NYSE:AMX), Dominion Energy, Inc. (NYSE:D), and Honda Motor Co Ltd (NYSE:HMC). This group of stocks’ market valuations are closest to GM’s market valuation. As you can see these stocks had an average of 23.75 hedge funds with bullish positions and the average amount invested in these stocks was $638 million. That figure was $5275 million in GM’s case. Dominion Resources, Inc. (NYSE:D) is the most popular stock in this table. On the other hand America Movil SAB de CV (NYSE:AMX) is the least popular one with only 12 bullish hedge fund positions. Compared to these stocks General Motors Company (NYSE:GM) is more popular among hedge funds. Our calculations showed that top 15 most popular stocks among hedge funds returned 19.7% through March 15th and outperformed the S&P 500 ETF (SPY) by 6.6 percentage points. Hedge funds were also right about betting on GM, though not to the same extent, as the stock returned 14.9% and outperformed the market as well. Itau Unibanco Holding SA (ITUB): Are Hedge Funds Right About This Stock? 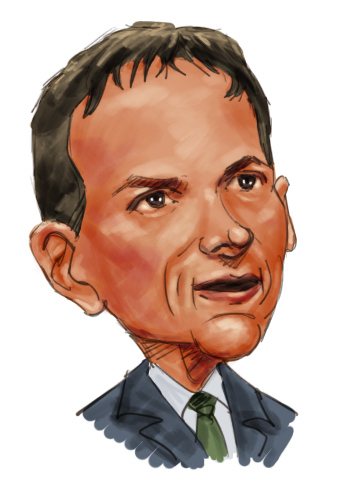 Hedge Funds Have Never Been This Bullish On Thermo Fisher Scientific Inc. (... Were Hedge Funds Right About Buying Costco Wholesale Corporation (COST)? Were Hedge Funds Right About Buying United Technologies Corporation (UTX)? Do Hedge Funds Love Diageo plc (DEO)? Were Hedge Funds Right About Dumping Twenty-First Century Fox Inc (FOX)?